In 12 years playing professional football, Gatski snapped the ball as center in 11 championship games, coming out on the winning side eight times. He played with the Cleveland Browns (1946-1956) and ended his career the next year with the Detroit Lions. Seven of his rings were won with Cleveland (four in the All American Football Conference, three in the NFL); the eighth came in Detroit’s conquest of his former teammates in the 1957 title game. In 20 years of high school (in Farmington, W. Va.), college (two years at Marshall College, one year at Auburn) and pro football, Gatski never missed a practice, a game or even called a time-out. In 1985, he was elected to the Pro Football Hall of Fame. By: Donald R. Smith, V.P. Frank played with the Cleveland Browns from 1946 through 1956 and then enjoyed a final season as an every-down, every-game regular with the 1957 Detroit Lions. Gatski’s premier performances over a long period of time did indeed “speak for themselves.” In 1985, he was elected to the Pro Football Hall of Fame. Like any offensive lineman who plays an important role in making his team’s offense click, the center is rarely noticed – unless he makes a bad snap – and his name is hardly ever noted in the record books. Gatski’s one statistical entry was a touchdown interception return during a brief stint as a linebacker during his rookie campaign in 1946. Frank nevertheless can point with pride to one single distinction, while not listed in the record book, that is unmatched by any other non-kicker in 97 years of pro football. He played in 11 championship games in 12 years with his teams winning eight times. 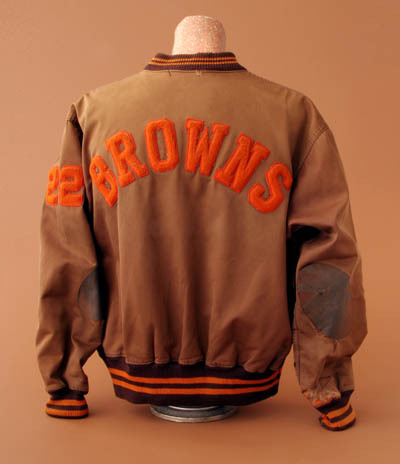 The Browns won all four All America Football Conference championships and then played in six straight National Football League title games from 1950 to 1956. They won the NFL diadem in 1950, 1954 and 1955. The Browns missed the playoffs in 1956, but Frank earned his eighth championship ring in 1957, when the Lions overwhelmed his old team, 59-14. He ended his career two weeks later in the 1958 Pro Bowl. “Gunner,” as Gatski had been known since his Marshall College days, had the ideal physical requirements to become the anchor man for the offensive line that powered pro football’s most potent offense of the era. At 6-3 and 240 pounds, he had the bulk and strength necessary to withstand the fiercest charges of some of the NFL’s finest defensive stars. If one of Gatski’s traits stood out above all others, it would be his durability. He never missed a game, a practice or even called a time-out in 20 years of high school, college and pro football. “You’ve got to be tough to play pro football,” Gatski explained. Without a doubt, Gatski came by his toughness and hard work ethic naturally. Born on March 13, 1922, in Farmington, West Virginia, in the heart of the coal country, Frank grew up in Number Nine Mine Coal Camp and then played four years of football at Farmington High School. After high school, Frank went to work in the mines just as everybody who lived in Number Nine Camp was expected to do. But a year later, Gatski got a chance to try out for the Marshall College team. Those who survived the pre-season tryout were given jobs on campus – the others returned home to the mines. Gatski not only made the squad but he won a starting job as a freshman in 1940. He held his job for two seasons and then entered the Army in 1943 in what would have been his senior year. After his return from two more years of infantry service in Europe in 1945, Gatski played in his final collegiate season at Auburn University. With the emergence of the new AAFC in 1946, “Gunner” got a chance to play pro football. Just like at Marshall six years earlier, he had to undergo a “survival of the fittest” ordeal in his first training camp. He did beat out some highly-publicized players for a spot on the roster, but, unlike his college experience, “Gunner” had to wait almost two years before he won a starting job. Once he did, he played virtually every down for the next nine seasons and was accorded all-NFL honors four times in 1951, 1952, 1953 and 1955. Gatski played at a time when pro gridders received relatively low pay. His annual salary never surpassed $10,000. He did earn eight championship bonuses, however, his biggest being the $4,295 awarded to each Detroit Lion after the 1957 NFL title game.